Meet Sparky and the Smarts - an ordinary family who frequently find themselves in extraordinary situations!Stanley's fantastic forecast: Sparky's brother Stanley is definitely a weather enthusiast - and he's entering a competition that could win him the chance to write for a newspaper! Will things go to plan, and will he get a step closer to fulfilling his lifelong dream of becoming a TV weatherperson? Hospital havoc: Mrs Smart has to stay in hospital for a little while, so Auntie Bella and the crinkly cousins return to Priory Park to `help out' the family in the meantime... what could possibly go wrong? !Llamas, shorts and the fateful fete: The school summer fete is coming up, and Mrs Smart is in charge of sorting out the donkey rides - but there are no donkeys! The pressure's on - will Sparky and Grandad be able to help? 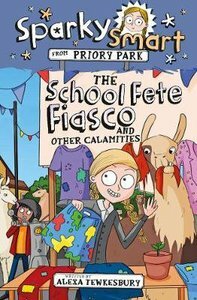 About "The School Fete Fiasco and Other Calamities (Sparky Smart From Priory Park Series)"